From time to time, I have to remind myself to pay attention to my produce on hand. I tend to get carried away by the beauty of fresh vegetables at the grocery, and sadly admit to letting more than my fair share of produce go bad before I’ve integrated it into a meal plan. I think I’m going to have to put myself on a shopping ban. But before these tomatoes went bad, I was inspired to re-create a meal I had on the Big Island in Hawaii a couple years ago. It’s been awhile, so I’m not sure this at all resembles what I had, but we loved the result. Feel free to use canned tomatoes if you don’t have fresh on hand, as peeling and seeding is kind of a chore. I’d advise you to leave your onions on the crunchy side – it adds a lot to the dish, but they will still be delicious and sweet if you soften them all the way. And you know me, in retrospect it would have been even better with some olives thrown in for good measure. As for peeling tomatoes, cook books generally advise scoring one end with an X, then blanching and peeling. I find the process significantly easier with my OXO vegetable peeler. I core the tomato, then peel from the cut down the length of the tomato using a slight wrist jiggling to gently ease the peel right off the surface of the tomato, no large pots of boiling water required! As for the seeding, I gently scrape the seeds from the flesh with my paring knife. I think this sauce would be excellent paired with a bucatini pasta. Does anyone remember eating that kind of pasta more than 5 years ago? I don’t, but perhaps I wasn’t paying attention. In any case, it seems to be one of the more recent food trends. Prepare the bacon in a wide skillet over medium heat. When crisp, remove to a plate covered with paper towels. Drain all the fat except for about 1 teaspoon to a coffee cup and reserve for later use. Slice the ends off of onions, then peel. With a cut side facing down, slice into half, then half again then into wedges to create little crescent moons of red onion. Cook onion in remaining bacon drippings for about 4 minutes. Peel tomatoes, seed, give a rough chop and add to the onion. Sprinkle with salt and pepper, reduce heat to low, then cook for 10 minutes. Bring a large pot of salted water to a boil. Cook pasta of choice to package instructions for al dente. Add crushed red pepper and 1 ladle of pasta water to tomato sauce, then cook for 5 more minutes. Crumble reserved bacon, then add to tomato sauce. Add drained pasta to sauce, toss, then serve. I love the simplicity of this dish. My father’s garden produces a lot of tomatoes, so I know that we would have plenty of opportunity to make this dish, again and again! 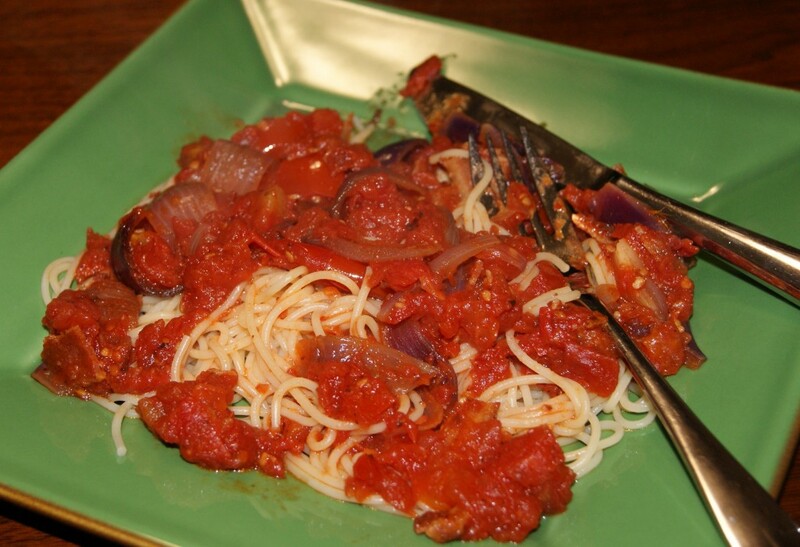 Thank you for sharing a delicious and easy entree. I will be trying it soon! Thanks for the tip on peeling tomatoes. I’ve been putting them in baby food lately and the boiling just adds an extra step. I will try your way since I have the same peeler!